Looking for some cool indoor fun to get away from the Florida heat? 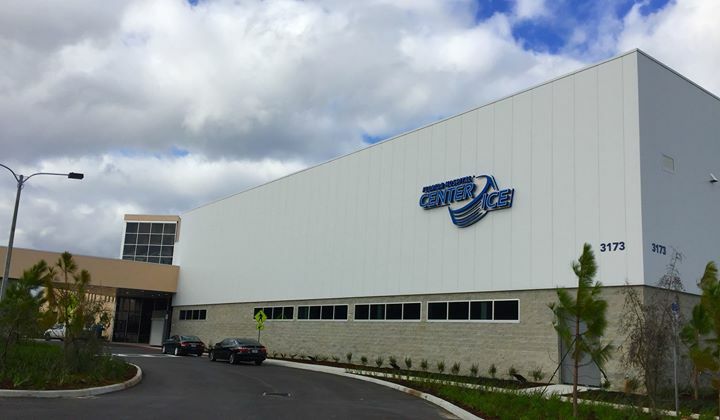 The new Florida Hospital Center Ice facility in Wesley Chapel is your fantastic new home for ice skating, hockey, and much more! Located at the intersection of I-75 and State Highway 56 just north of Tampa, this spectacular complex has four NHL-sized rinks and plenty of ways to take to the ice however you like. Center Ice has an emphasis on teaching you how to play and compete. It administers Learn to Skate USA classes, helping people of any age and ability learn how to ice skate in a fun and safe environment with professional instructors. Your skating lessons can be focused on regular ice skating, figure skating, or hockey skating. For more advanced skaters, there are synchronized skating and theater on ice classes in the works. Figure skaters have their own set of courses to learn the basics and improve their technique. Florida Hospital Center Ice ​offers the U.S. Figure Skating Program to help everyone from beginners to future Olympic hopefuls. The program trains skaters on and off the ice, with professional coaches staffing an elite training academy, synchronized clinics, ice shows, and competitions. Freestyle sessions also allow skaters the chance to work on their individual programs set to music. Curling has never been more popular in the United States following their magical gold medal win in PyeongChang (just ask anyone who stayed up until five in the morning to watch the gold medal match live). In most ice complexes, curlers have to share the rink with hockey players and skaters, and conditions can be tricky at best. Not at Center Ice -- they have a dedicated curling rink with the pebbled ice that makes the granite stones slide and curl. Center Ice offers a three-week "learn to curl" class or a one-time "intro to curl" session so you can try out this fascinating game. The Tampa Bay Curling Club calls the rink home, holding their seasonal curling league there. Want to learn how to play hockey? Florida Hospital Center Ice has hockey lessons for kids and adults to teach them the basics of the game through skating, passing, shooting, and game situation drills. In order to sign up for classes, kids ages 5-14 must complete the Hockey 1 course in the Learn to Skate program. Adults need to complete the Hockey 3 skating course. For more advanced youth players, Center Ice is working on a hockey academy, and there are camps and clinics year-round to help experienced players improve their skills. If you're ready to hit the ice for a game, Center Ice offers rec league hockey for players of all ages, plus pick-up hockey for youth players. It's also the home rink for the University of South Florida's club hockey team, the Ice Bulls. No matter what ice sport you want to conquer, the staff at Florida Hospital Center Ice in Wesley Chapel is ready to teach you how. With classes in ice skating, figure skating, hockey, and curling for both kids and adults, you'll learn everything you need to know to compete and stay cool all year long! Visit 813area.com to keep up with Tampa sports news and all the latest and greatest events around town. Don't forget to sign up for free email updates! Photo courtesy of Florida Hospital Center Ice biz page.